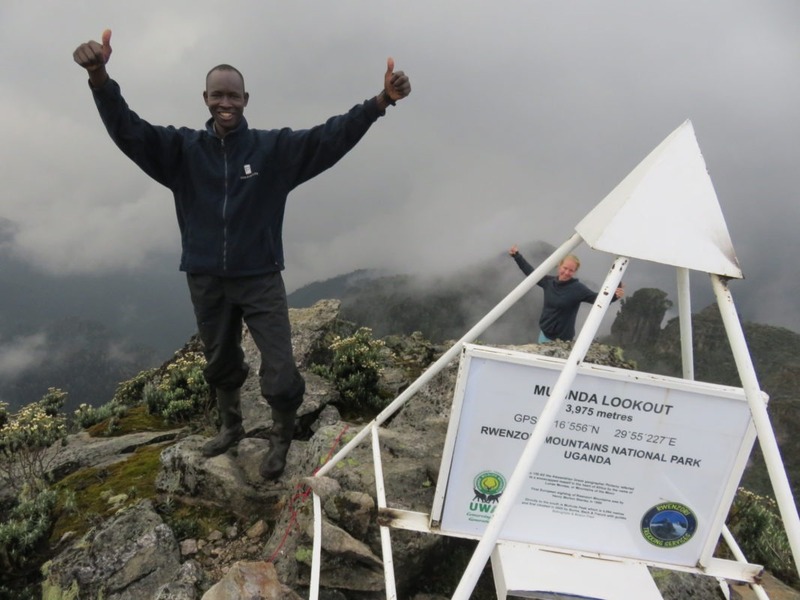 Margherita Peak stands at an impressive 5,109 meters on Mt Stanley in the Rwenzori’s Mountains of western Uganda. 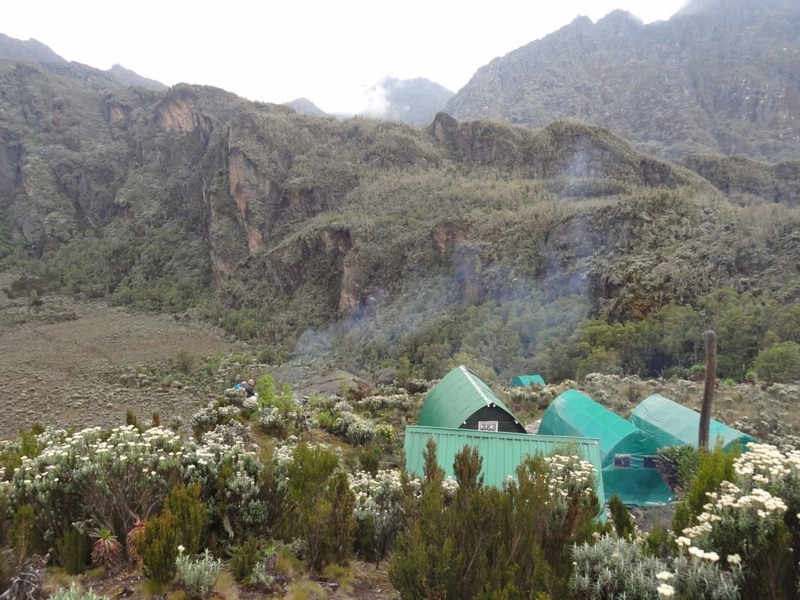 This 8-day trek allows for ample acclimatisation time and takes you through stunning scenery all the way to the peak. 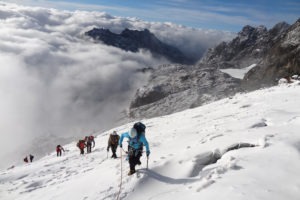 Unlike the more popular Kilimanjaro or Mt Kenya which are stand-alone mountains with a relatively straight forward up and down summit trek, the Rwenzori’s are Africa’s highest mountain range and as such have many accents and descents involved in reaching the peaks. 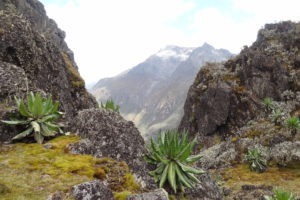 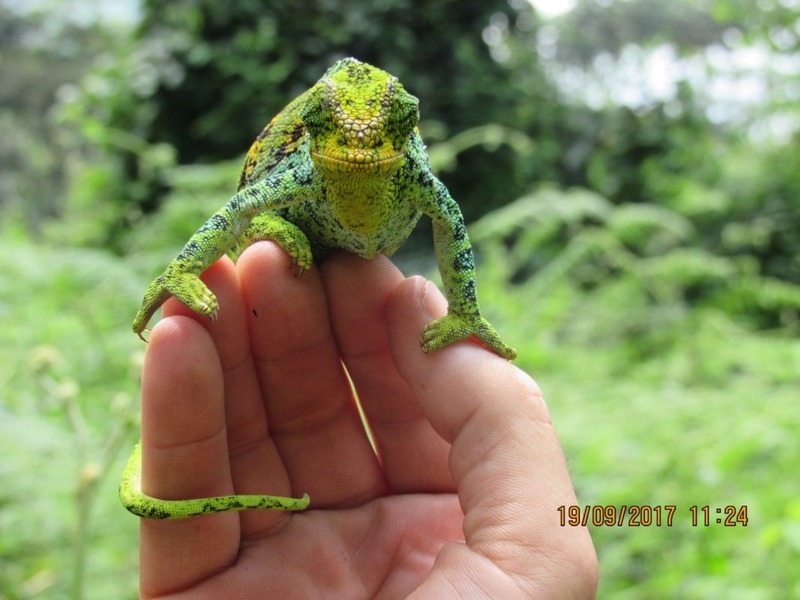 This in combination with much more affordable prices, large biodiversity, beautiful scenery and far less tourism makes trekking the Rwenzori’s arguably Africa’s best trekking experience! 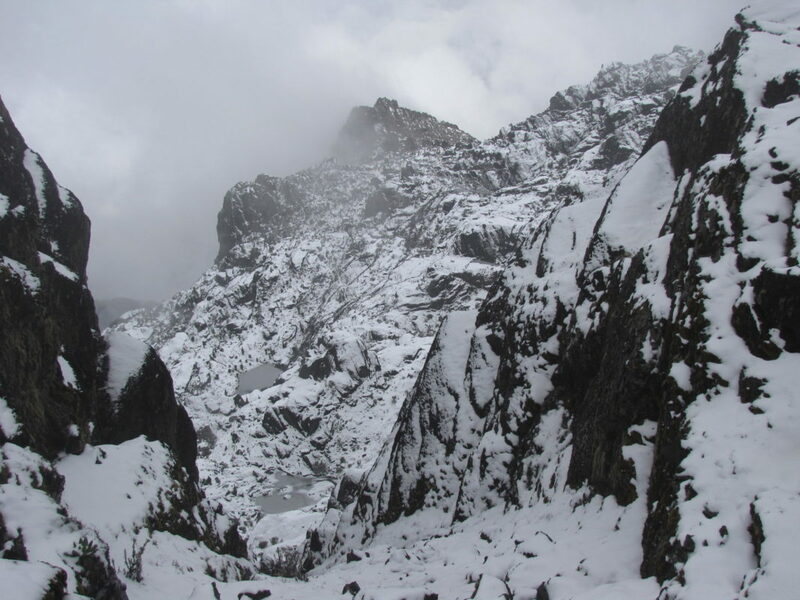 Margherita Peak at 5,109 metres on Mt Stanley in the Rwenzori Mountains, is Africa’s third highest mountain, however the real beauty is in the climb up the Kilembe route, the forests and valleys, the flora is diverse from giant heather trees and valleys of ferns. 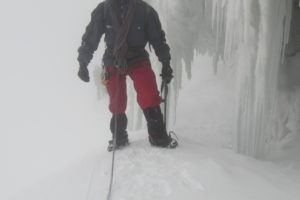 Climbing Margherita Peak is now technical due to the ever-increasing number of crevasses. 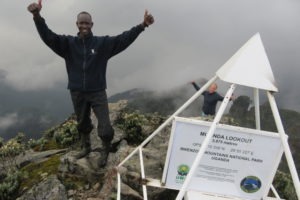 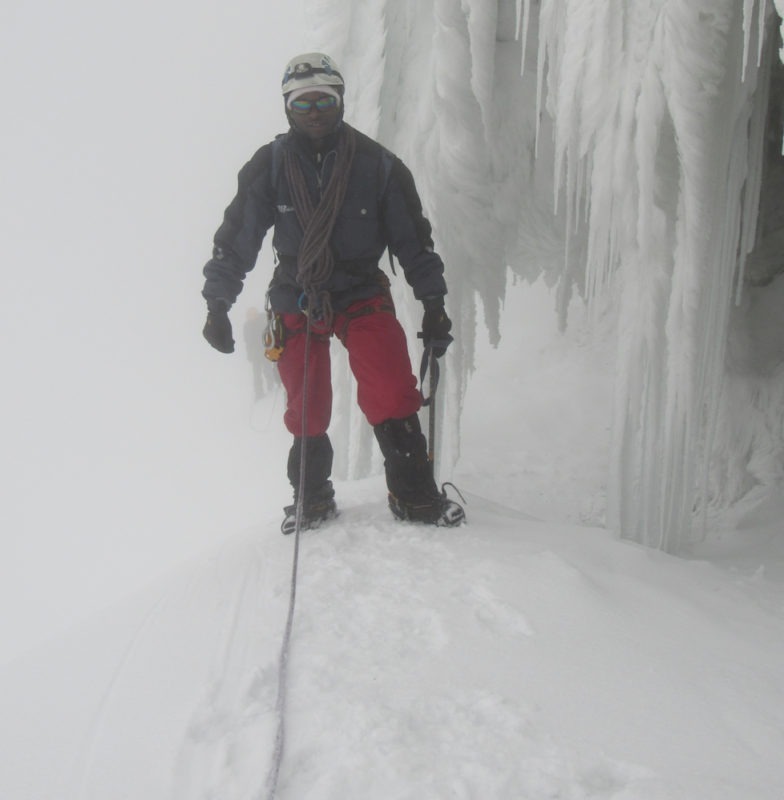 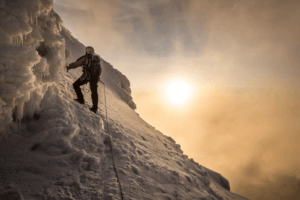 However, scaling the actual peak is more of a hard scramble than a climb and when it snows it is difficult but the rewards and exhilaration of reaching the top is enormous as you look across Albert Peak to the DRC (Congo) then east across the spectra of the Rwenzori Mountains. 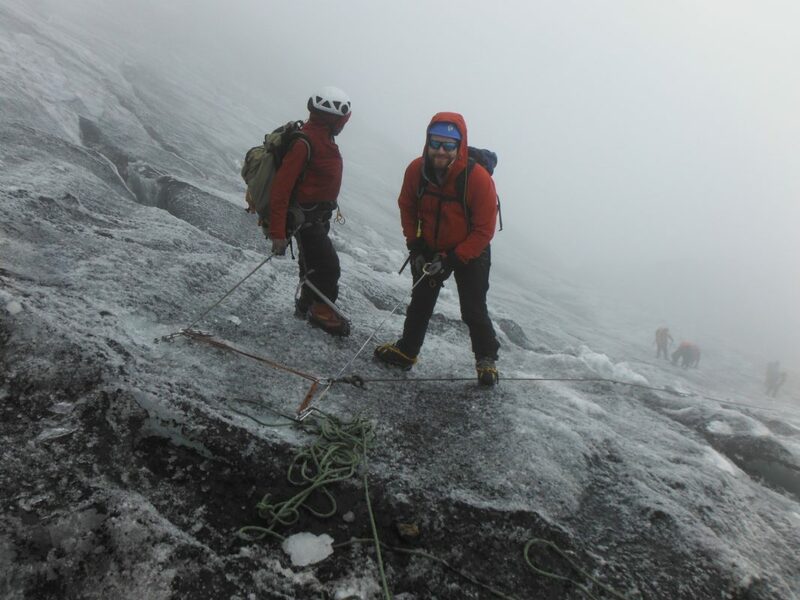 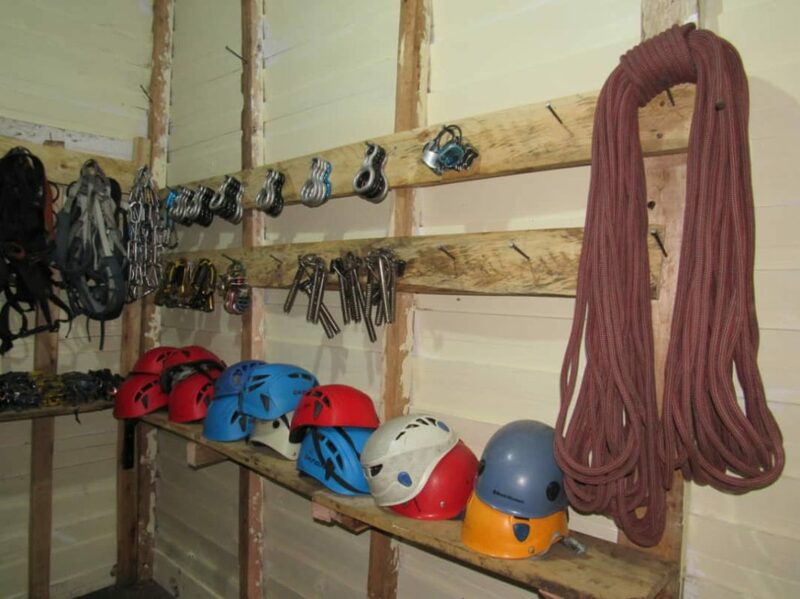 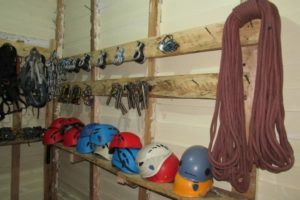 This eight-day trip is recommended for people of average fitness and climbing ability. 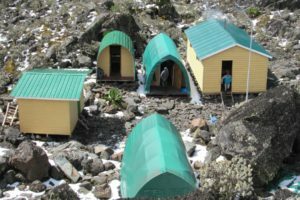 However, it is also possible to complete the trek in 7 days for those with higher tolerance to altitude and higher levels of fitness. 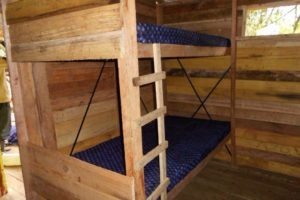 This is not recommended, but for those with plenty of experience, this is a possibility. 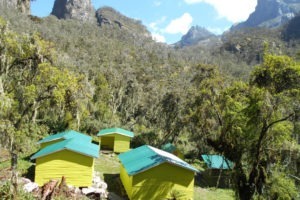 Start at Trekkers at 1,450 meters and sleep at Sine Hut at 2,596 meters being a height gain of 1,146 meters, or those who are fit and want to proceed to Kalalama Camp at 3,134 metres may do so and apart from the fantastic views gives you more time at Mutinda Camp where you may climb up to Mutinda Lookout at 3,975 metres. 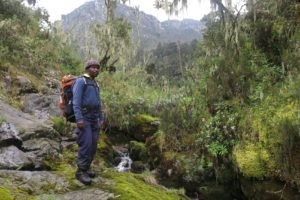 We start by walking up the valley floor through tall forest trees of the Afro Montane Forest Zone. 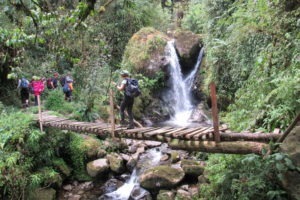 This is a steady climb with multitudes of birds and a chance of seeing blue monkeys scampering off through the forest. 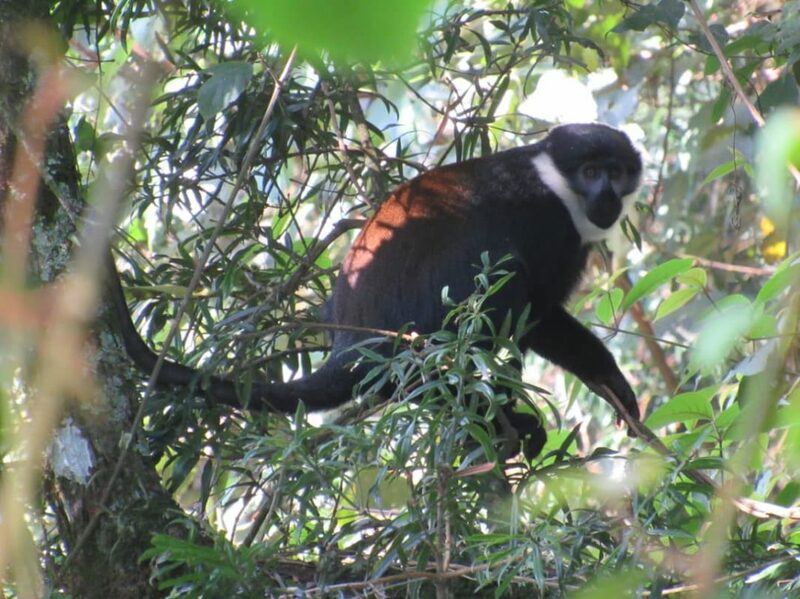 At times visitors may see troupes of 15 to 20 black and white Colobus monkeys as they swing through the tree tops. 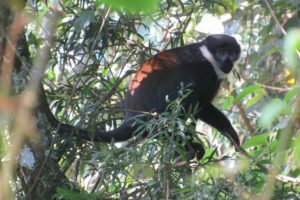 There are rare sightings of the L’Hoest monkey which are part of the Bukonzo cultural emblems and are protected by the virtue of the King or Omusinga or you may hear wild chimpanzee in the distance. 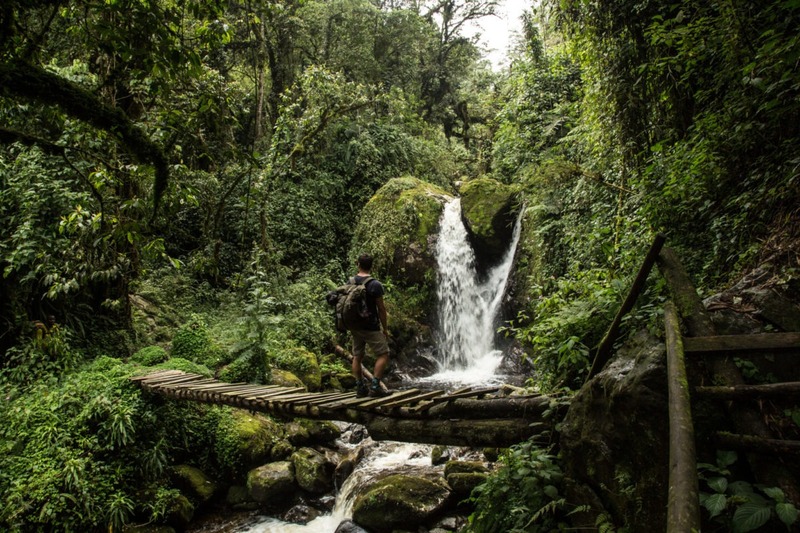 There is wide variety of plant species from forest trees to bamboos thickets, low shrubs, flowers, fungi, and with many moss and lichen covered vines hanging from the tall trees creating an awesome appeal. 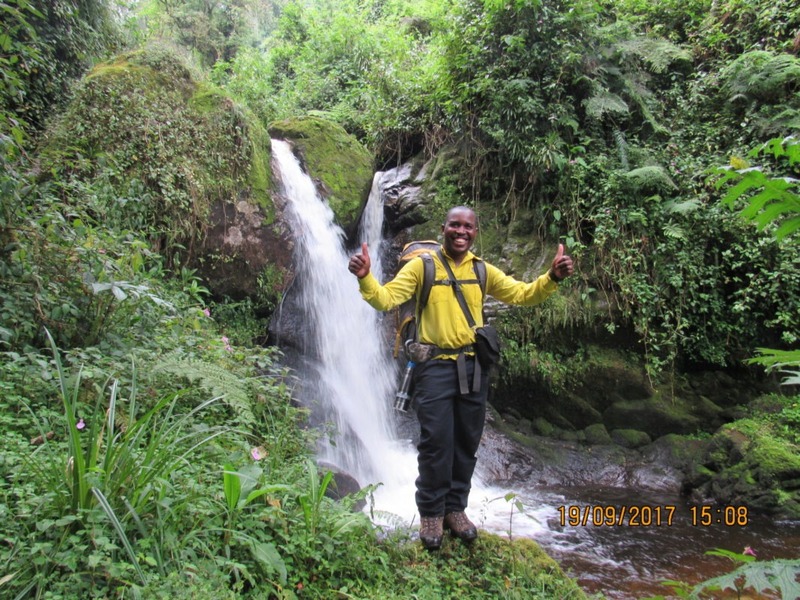 Enock’s Falls are just 200 meters from Sine Hut and offer a splendid opportunity to capture a great screensaver for your memories. 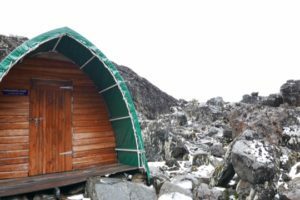 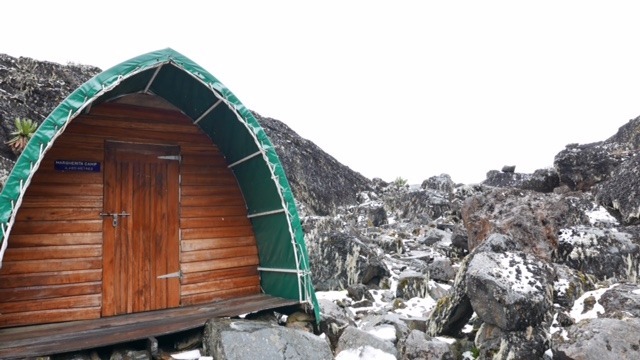 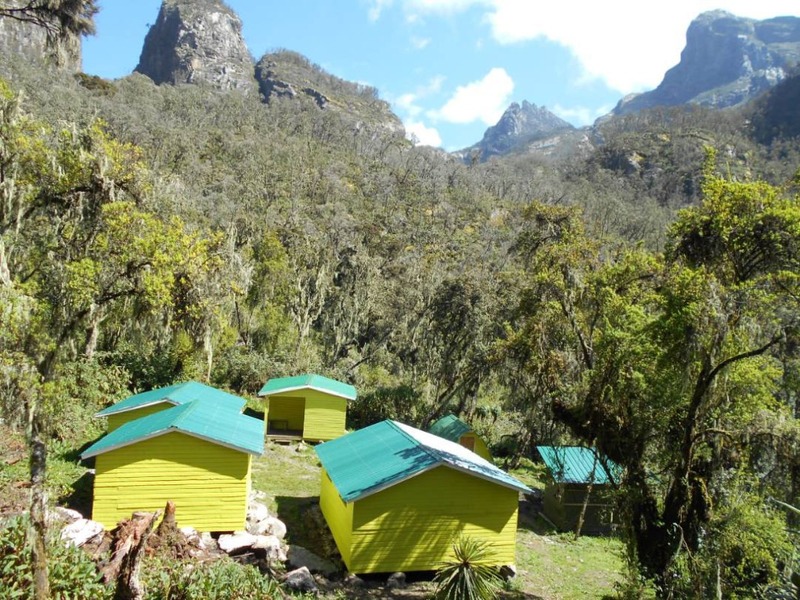 At Sine Camp 2,596 metres we have wooden huts set between tall forest trees on a narrow ridge where you may sit and enjoy the beauty of the Afro Montane forest while you look down at a fantastic waterfall crashing over the rocks far below. 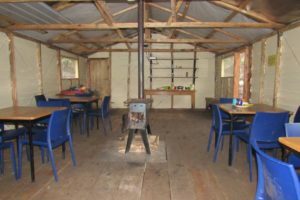 Some clients prefer to sit outside enjoying the warmth of the campfire and chat to the guides about the mountains and life in their community. 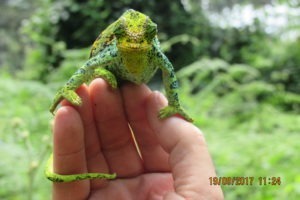 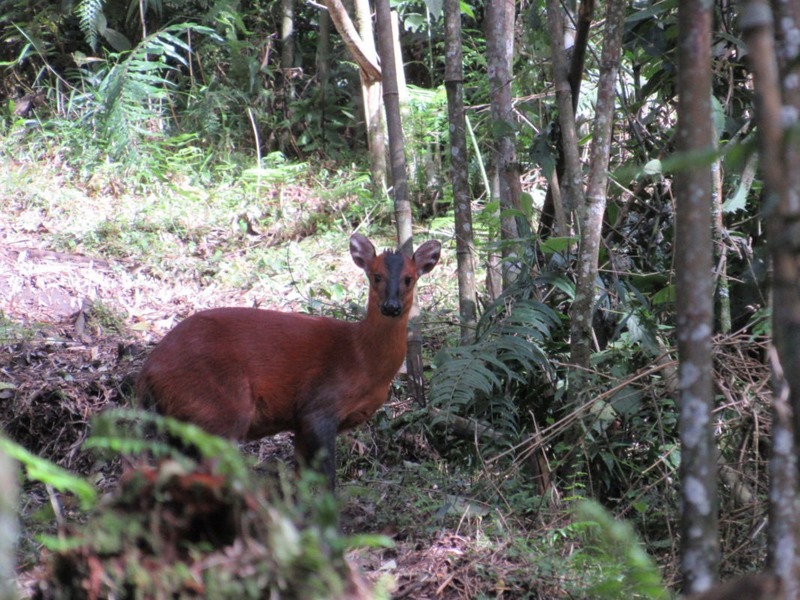 Sine is just below the bamboo zone and the area around has many different bird species. 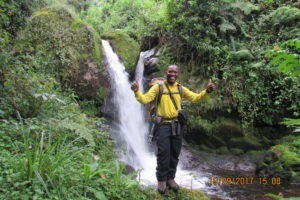 150 meters from the camp is Enock falls which is set in livid green vegetation and hanging vine. 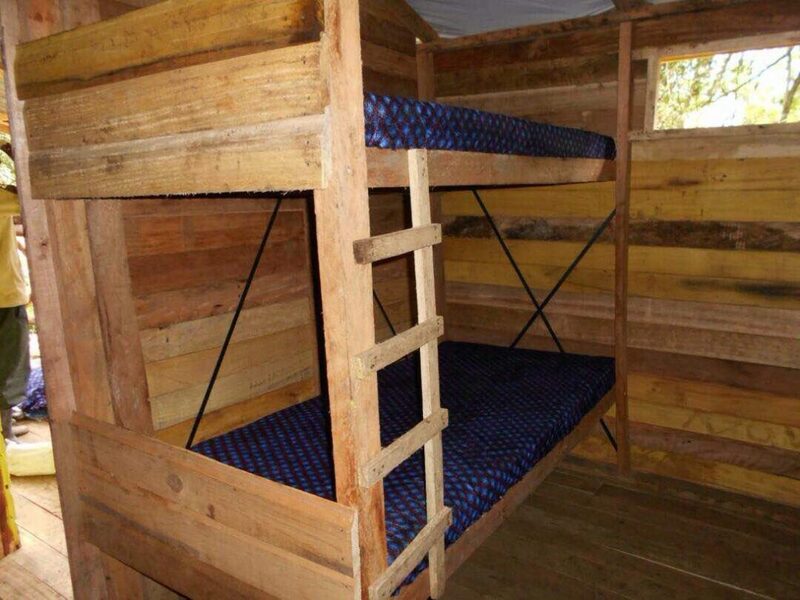 Truly beautiful. 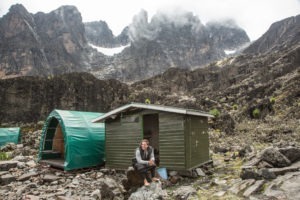 Sleep at Sine, or those who are fit and want to proceed to Kalalama Camp at 3,134 metres may do so and apart from the fantastic views gives you more time at Mutinda Camp where you may climb up to Mutinda Lookout at 3,975 metres. 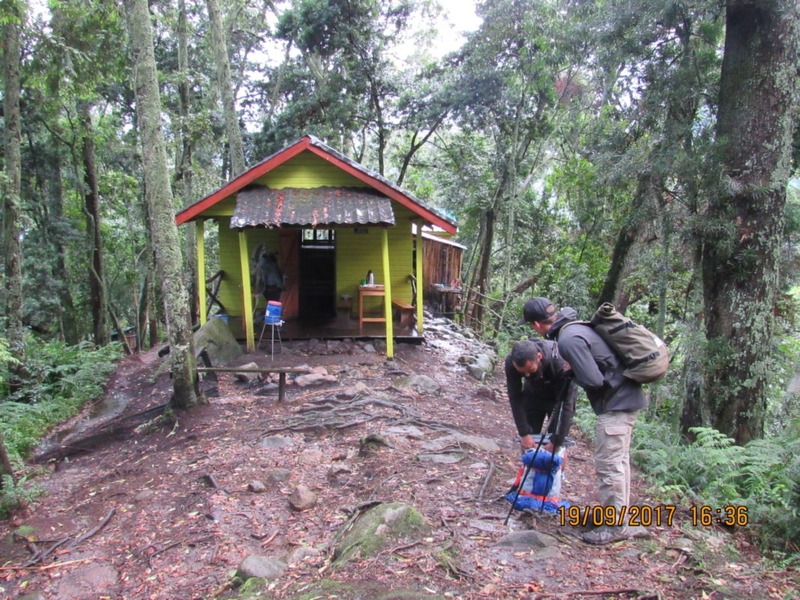 Trekking starts at 8.30am and almost immediately you enter the Bamboo-Mimulopsis Zone which is steep climb with many high steps. 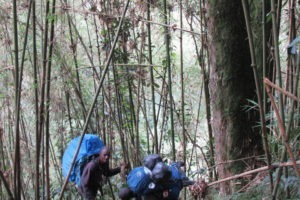 In the wet season the bamboo zone is rather muddy and slippery making the going slow. 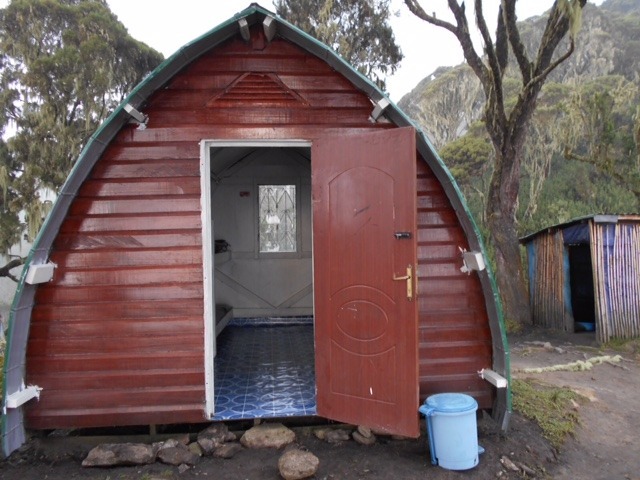 However the atmosphere and the forest is beautiful as you climb 551 metres altitude and a distance of 1.8km to Kalalama Camp at 3,147 meters which is in the Heather-Rapanea Zone where you can take a rest and a quick cup of tea or coffee before heading on to Mutinda Camp. 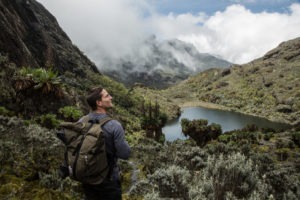 The trail meanders up and over several small knolls along a ridge top then drops down the side of the valley before climbing again, and in doing so cross several small streams and pass close to moss covered waterfalls. 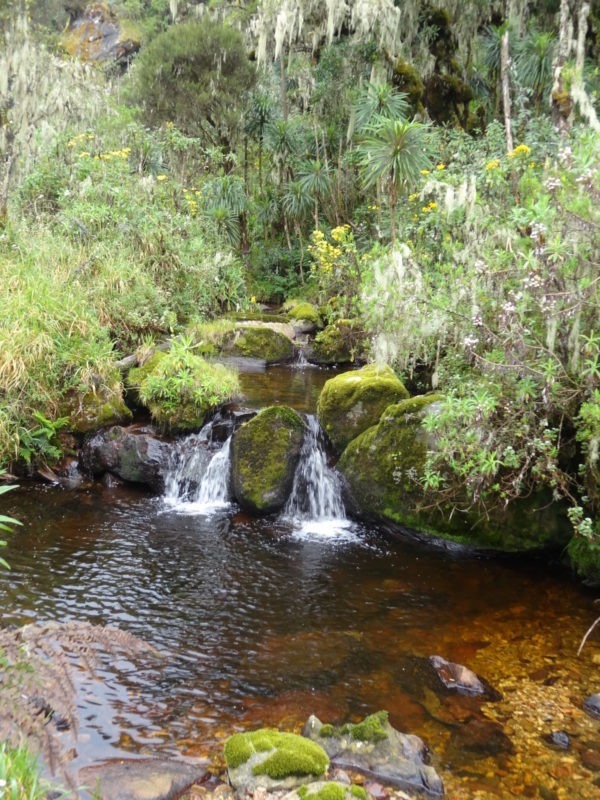 You then climb steadily along the side of a beautiful mossy river which tumbles down over the rocks under the Giant Heather trees whose trunks are covered in green moss with old man beards (Usnea lichen) hanging from the branches. 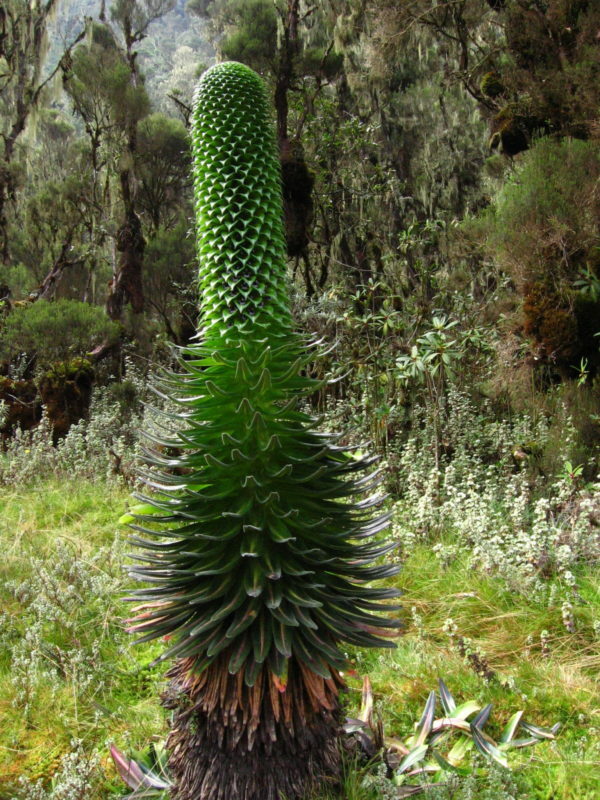 The trail twists and turns as you climb up the deep valley, which has an enormous variety of plants and flowers. 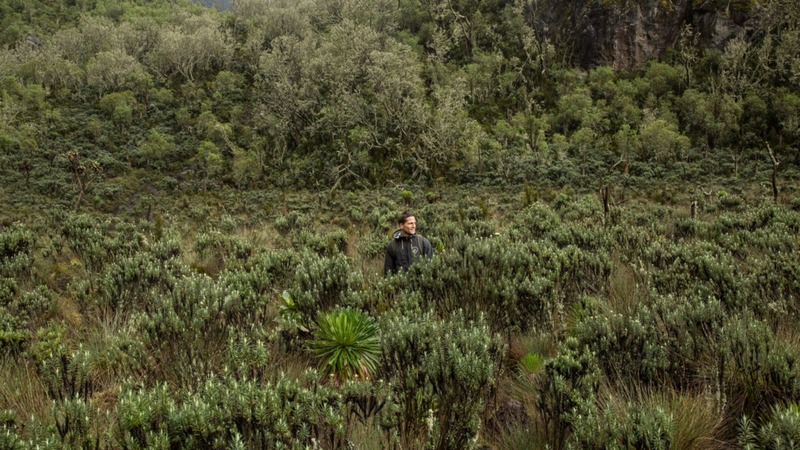 This valley is unique with many Giant Heather trees creating a beautiful atmosphere often shrouded in mist. 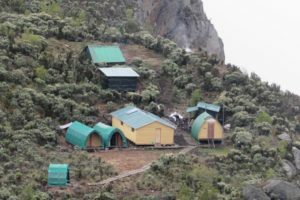 The trail to Bugata Camp is boggy particularly in the wet season but with a little skill you can step from tussock to tussock to make the going easier. 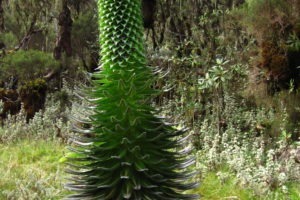 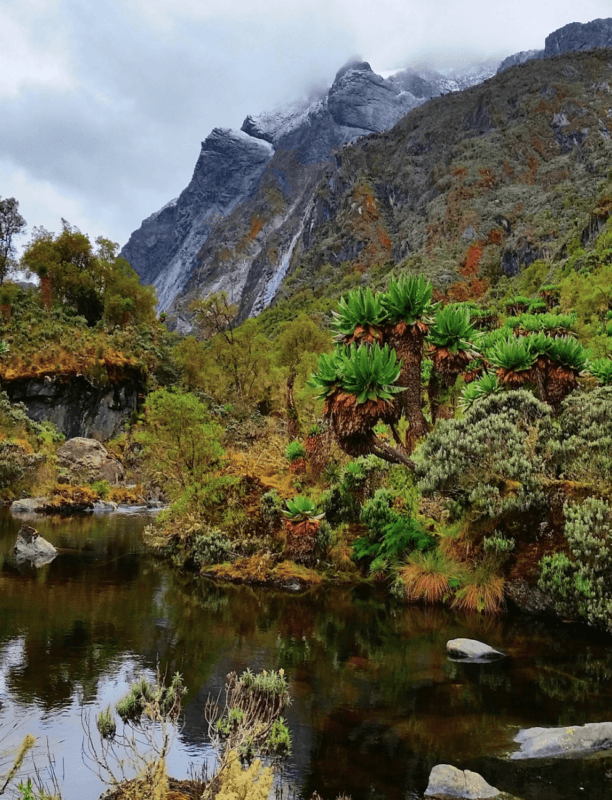 First you cross the Mutinda valley through the tussock grass and everlasting flowers interspersed with many Giant Lobelias before climbing a steep section up to the Namusangi Valley (3,840 meters), with sheer waterfalls and looking back you get fantastic views of Mutinda Peaks. 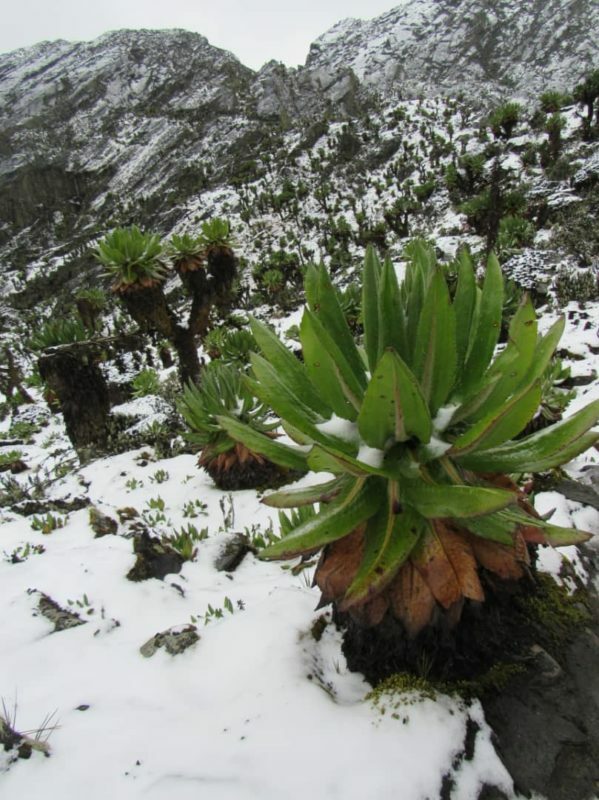 The Namusangi Valley is wide, with many ups and downs as the trail climbs steadily to Bugata Camp at 4,100 metres. 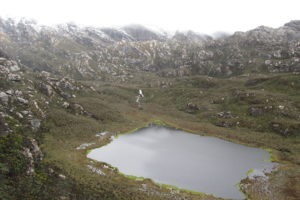 Trek to Hunwick’s Camp via Bamwanjarra Pass. 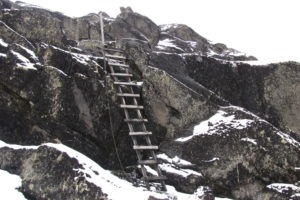 As you leave Bugata Camp you pass up a ridge then drop down slightly before ascending to Bamwanjarra Pass at 4,450 meters where we have a hut should the weather turn bad. 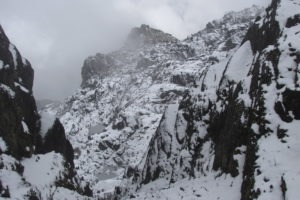 From the pass on a clear day you get excellent views of the three main peaks. 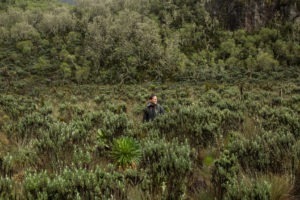 The trail passes down the valley and around the edge of some bogs and thick ever green vegetation, moss. 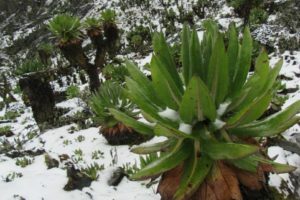 giant groundsel and lobelia. 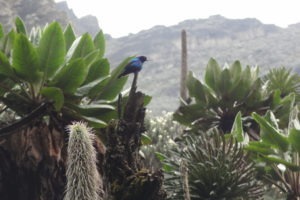 Here is possibly the best place in all the Rwenzori to observe the Malachite Sunbird as it feeds on the many lobelia flowers and a known breeding site. 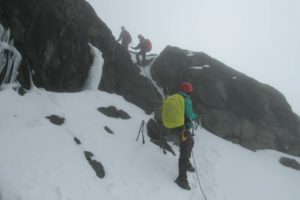 Farther on there is some steep sections before a steady climb up and over a ridge to Hunwick’s Camp which is situated on the top of a deep valley and has good views of Mt Stanley, Mt Baker, Weismanns Peak and McConnell’s Prong. 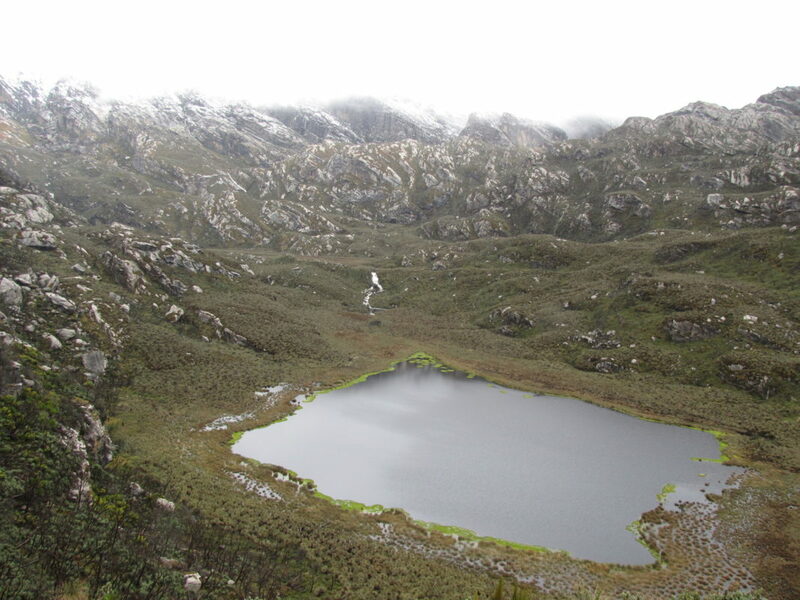 From Hunwick’s we pass down and across the valley floor to Lake Kitendara which is very stunning with deep water and beautiful vegetation. 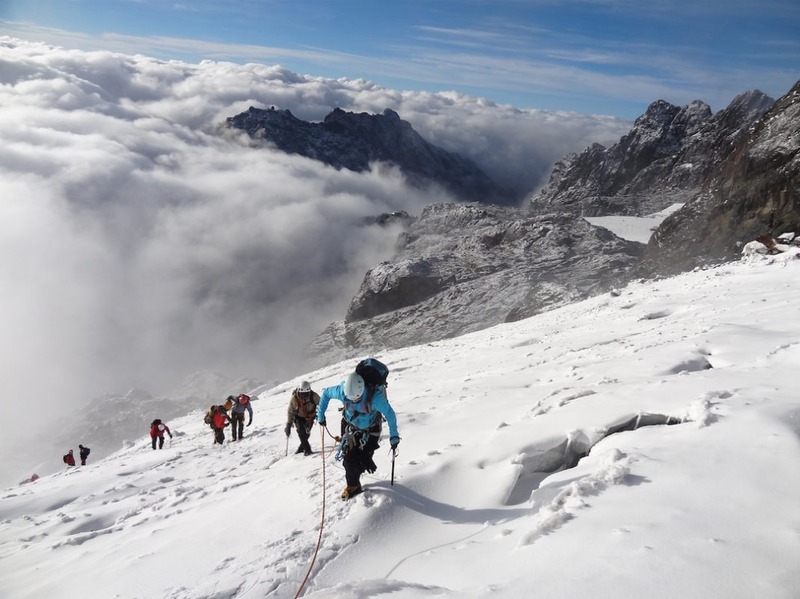 From here you climb up Scott Elliott’s pass then up the ridge to Margherita Camp 4,485 metres which is situated between some huge rocks and offering some shelter from the strong winds. 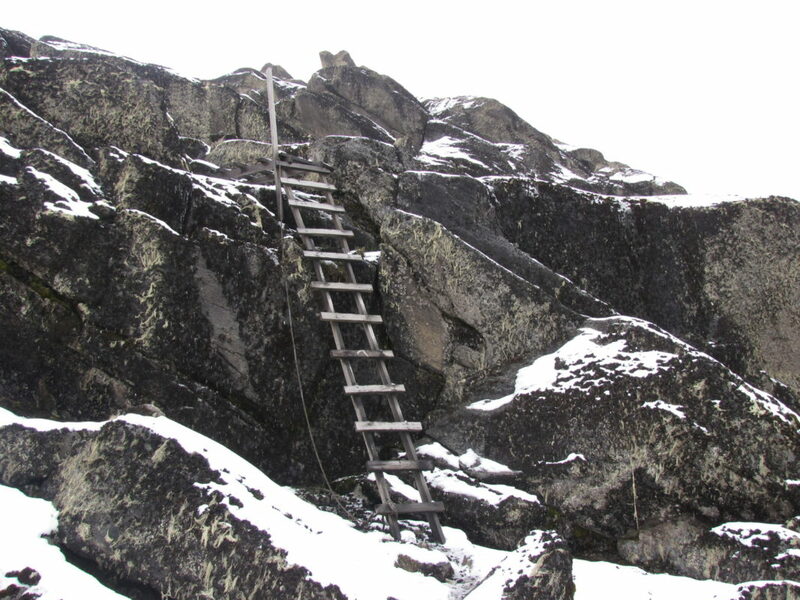 This is the very spot where the Duke of Abruzzi camped when making his climb to Margherita Peak in 1906. 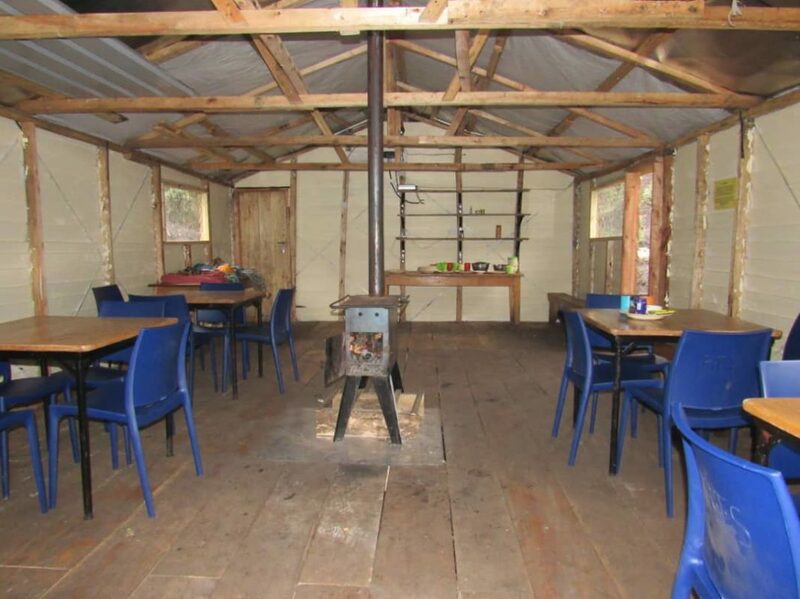 Wake up at 2am and catch an early breakfast before heading off to climb Mt Stanley at 2.30am. 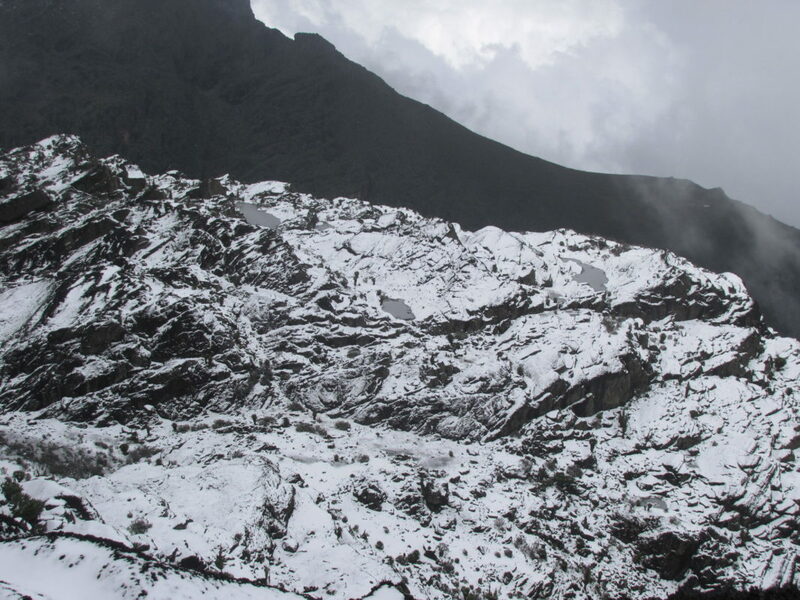 This is necessary as the weather has changed a lot and often even during the dryer season the mountain is closed in with heavy clouds and snow falls from 1 pm to 4pm and this happens within a short period of 10 to 15 minutes as the clouds rise up from the extensive Congo rainforests. 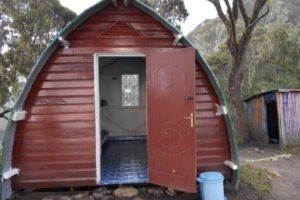 During January and February 2017 clients were closed in and unable to walk during heavy snow storms which previously were not heard of during the dryer season and arrived back at Margherita camp well after dark with one group arriving back at 11pm totally exhausted. 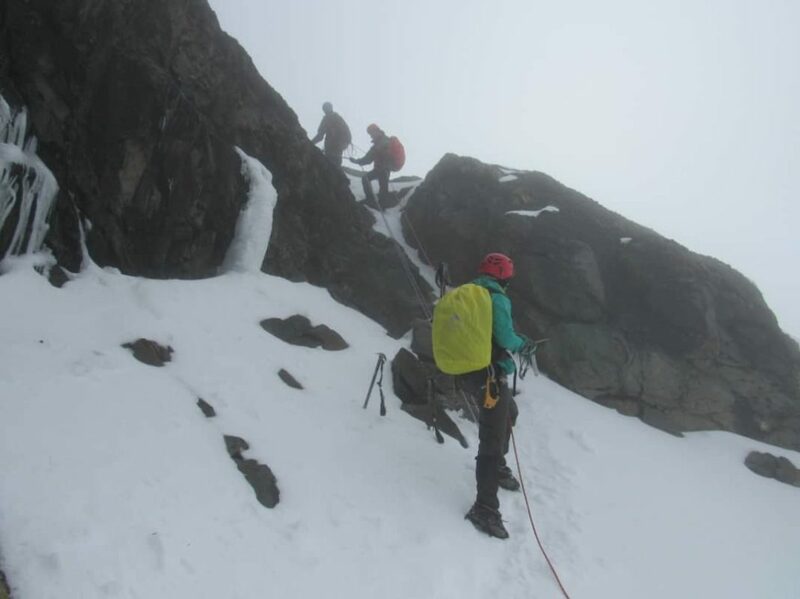 Due to this change in weather we have set a strict turn around time of 10am so if you do not reach the peak before then you must turn around regardless of the disappointment in the interests of safety. 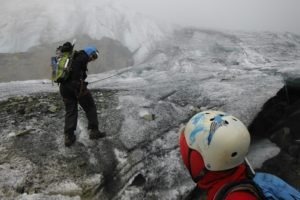 Margherita glacier has also suffered with global warming and as the outer edges of the glacier recede the ice is becoming steeper with one section of about 200 meters more than 60% grade. 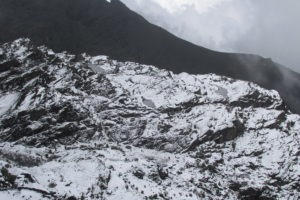 Combined with this much of the blacker has melted underneath causing caves under the ice and as it get thinner eventually caves in. 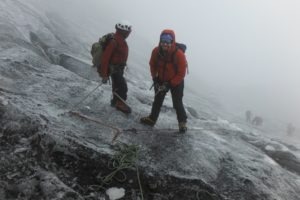 So is necessary that clients understand and take advice of where the guides suggest to pass. 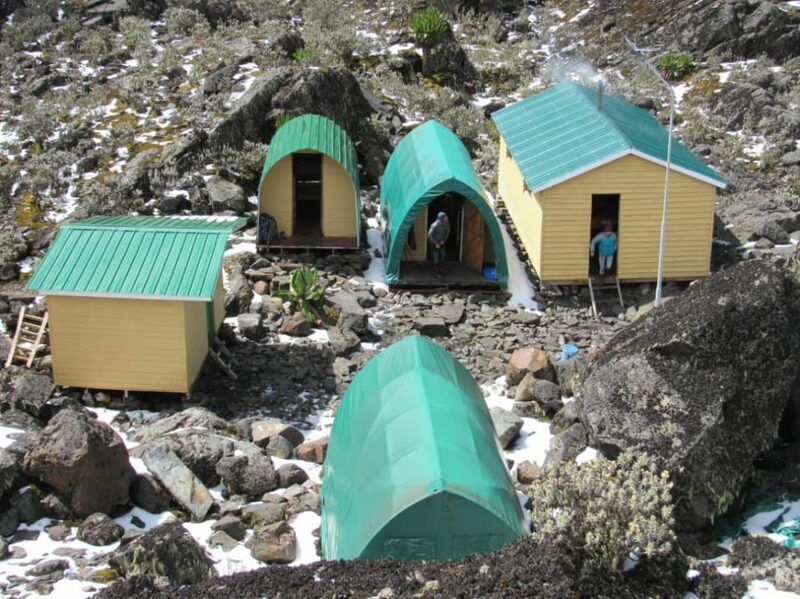 After ascending the peak at 5,109 metres you then pass directly down to Hunwick’s Camp at 3.874 metres. 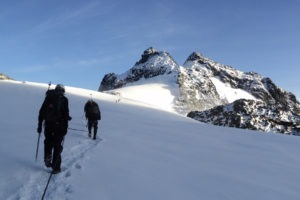 From Hunwick’s Camp we start the day by climbing up a ridge towards McConnell’s Prong where you get the best views of all three peaks and Scott Elliott’s Pass before reaching Oliver’s Pass at 4,505 metres. 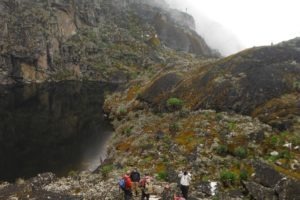 The distance from Hunwick’s Camp to the top of Olivers Pass is 3km The trail then cuts across below Weismann’s Peak to the confluence of the Nyamwamba River which flows down thought Kilembe and Kasese to Lake George in Queen Elisabeth National Park. 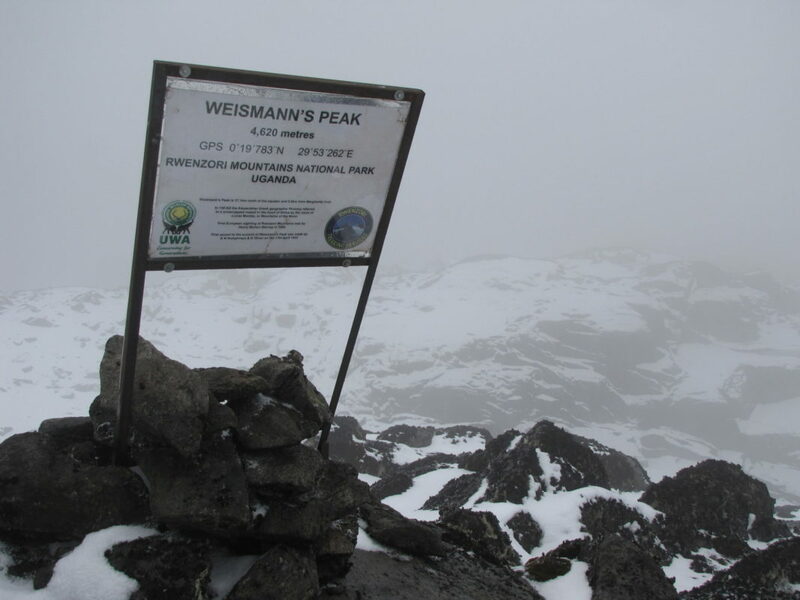 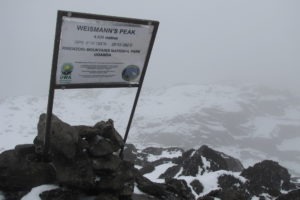 If you wish to climb Weismanns Peak 4,620 metres from Olivers pass you may do so at an extra cost of $20 each. On a clear day you get fantastic views of Margherita and Mt Stanley, Mt Speke and Mt Baker. 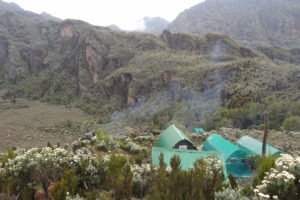 After crossing the confluence the trail meanders down the valley to Kiharo Camp at which is situated in a deep valley with high cliffs and dense vegetation. 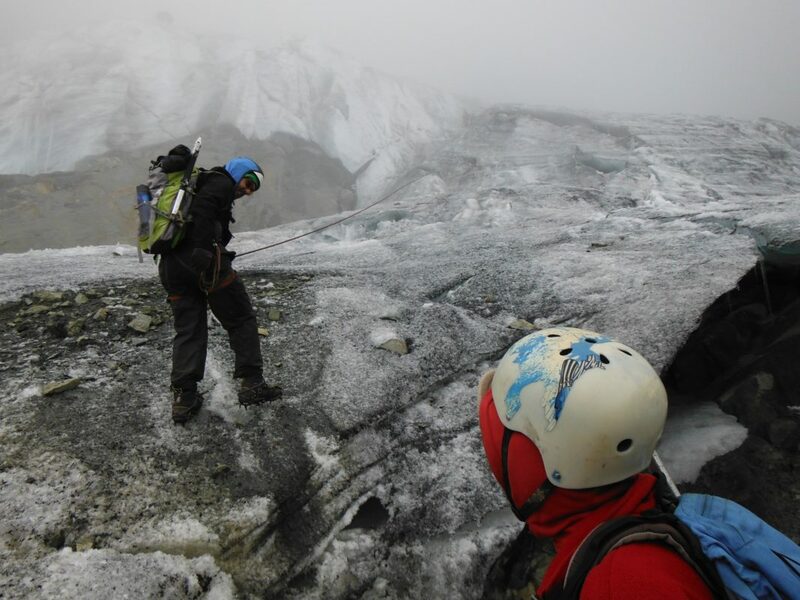 On the way down the valley after each bog you will climb over a ridge of stones and earth which seems out of place but actually was pushed there by slow moving glaciers which eventually stopped moving, melted and left a pile of rocks and debris in front of where the glacier once stood. 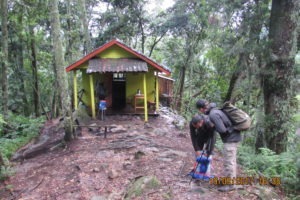 Distance Kiharo Camp to the park gate 12.2km and another 2.8km down to Trekkers Hostel Time to walk 5 to 8 hours so those who need to connect to flights back to Kampala or travel on to other activities need to leave Kiharo early. 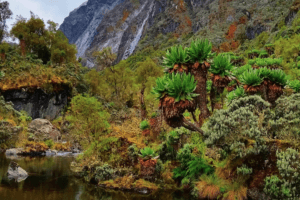 The trail down the Nyamwamba Valley is mostly downhill and absolutely stunning with beautiful views, moss covered rocks along the river, cascading waterfalls, deep valleys and forests are possibly the best in the Rwenzori Mountains. 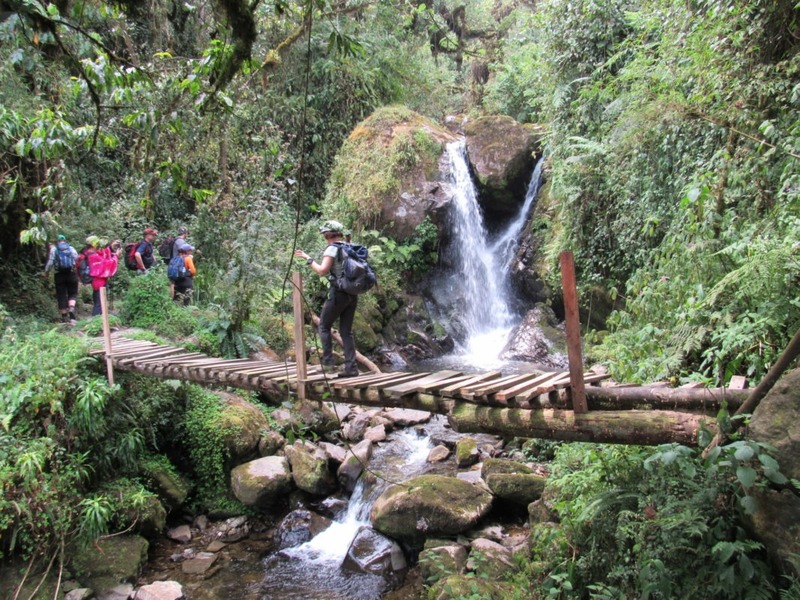 This part of the trail took us six years to find a way through and a route which is easy enough for tourists to use. 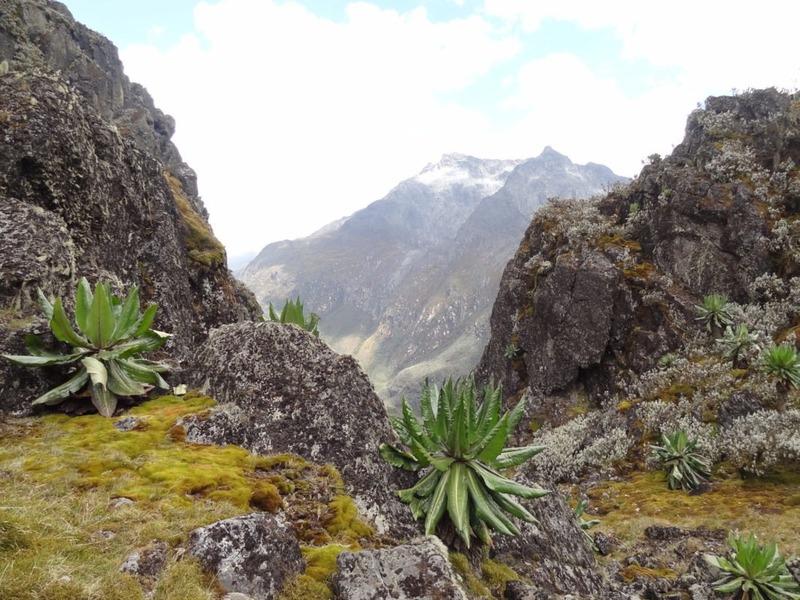 In 1937 the explorer and geologist McConnell tried to find a way up this valley but failed and have to turn back and search for another route up the mountain but now you can experience this truly beautiful valley. 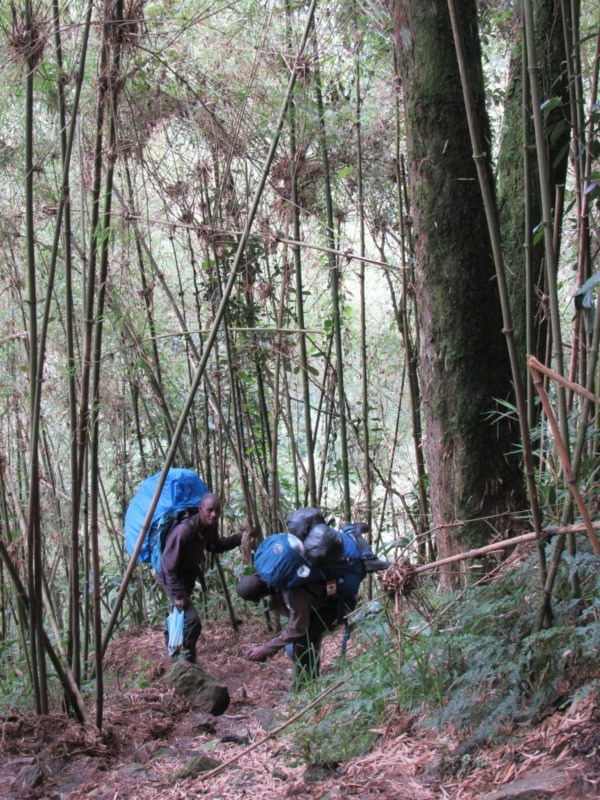 A few kilometers from Kiharo Camp the path turns off to the right to pass along the river. 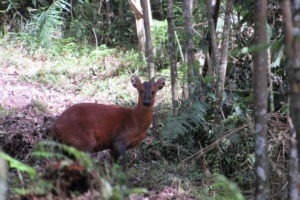 In the clear areas you may catch a glimpse of a Duiker quietly feeding in small clearings as you pass along the river. 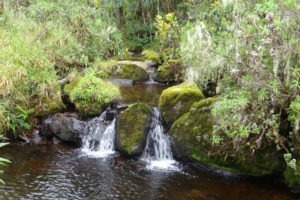 If you wish you may prefer to walk down the river itself hopping across the rocks as you pass down. 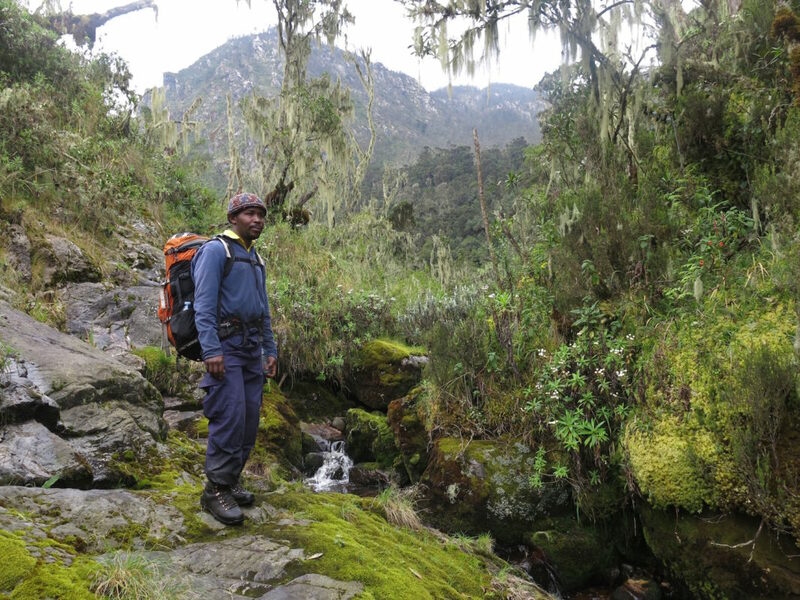 A few kilometres down the river it becomes very steep with multitudes of waterfalls so we have to move away from the river and follow a narrow ridge to bypass steep sections. 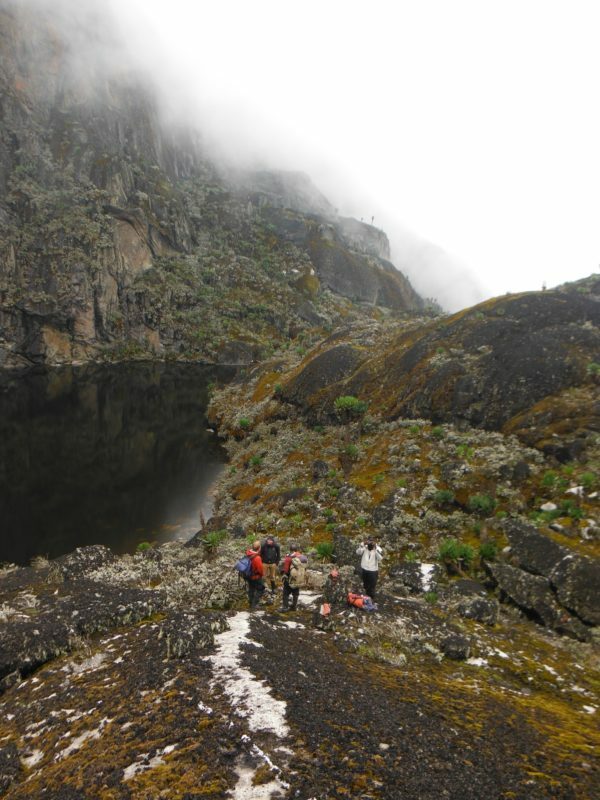 At the bottom we again meet the river where there is a huge rock shelter and a place to rest for a while. 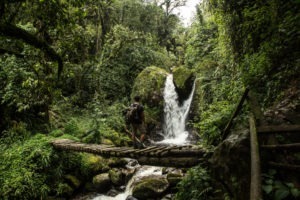 After crossing a small stream you climb up a gentle slope before turning back down to the river to avoid another set of waterfalls which are impassable. 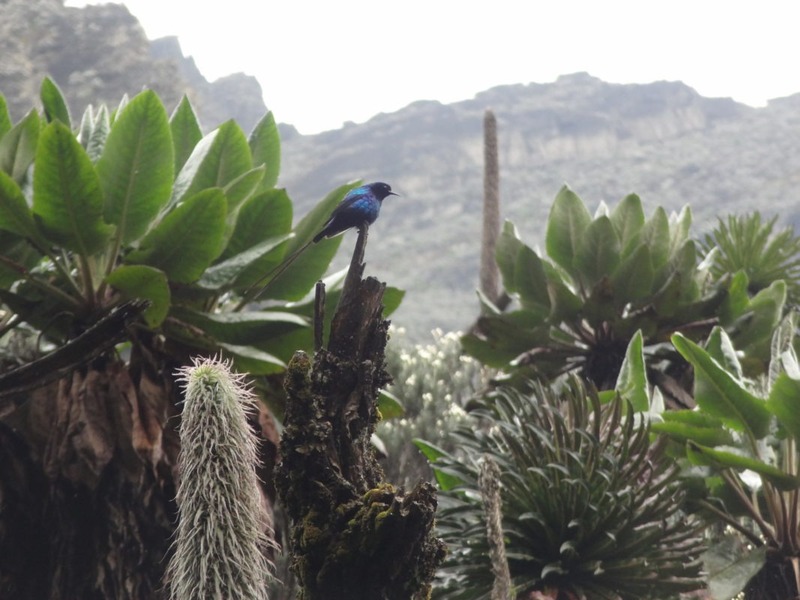 The forest along this section is magnificent and full of life with many birds, primates, dikers and hyrax. 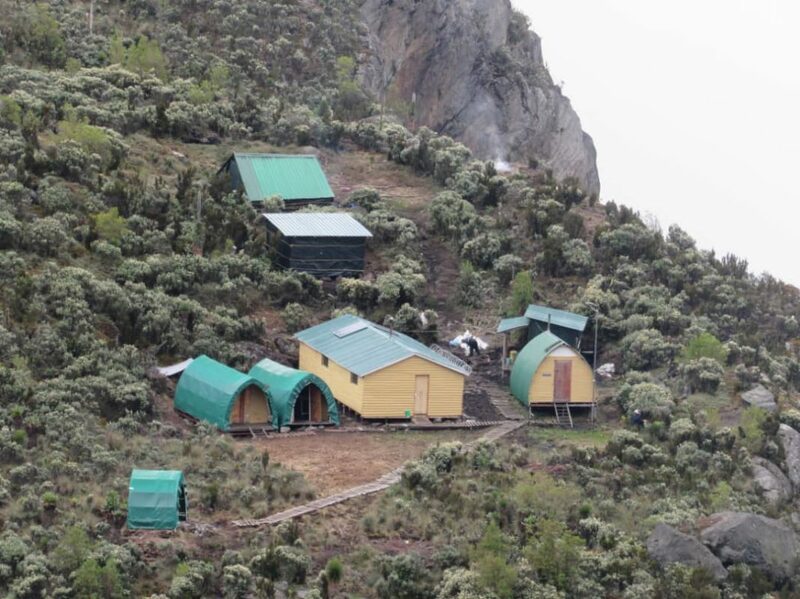 A great experience and ending to a fantastic trek.